The B&M transmission cooler will need to mount under the chassis. The cooler was clamped in various places until a suitable location was found. This wasn't it - there isn't enough room for the fittings between the transmission mount and the cooler. The transmission pan is the lowest point under the chassis and the car has a rake in the rear, so road clearance isn't a concern. I fabricated a cardboard scoop to use as a template and took it out to Big Moe Products/MRI Machine to have them make one out of aluminum for me. They not only have the proper materials lying around but they also have a sheet metal break with adjustable/removable inserts, so forming a box is no big deal. Normally your bends will start to interfere with one another as you form the box. They also weld aluminum like no other so it was a no-brainer - have them do it right or fabricate my own piece of junk - easy decision. The way this will mount is simple - and simple is good. Four bolts will hold it securely in place. 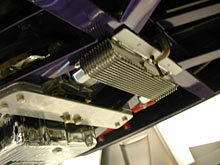 The two front bolts will bolt directly through the cooler into the center cross member of the frame and two tabs at the rear of the scoop will sandwich the cooler between the rear cross members and the scoop. 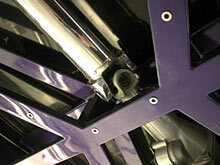 Riv-nuts were installed in the frame to mount the cooler. The cooler will sit directly behind the center cross member right below the front driveshaft U-joint. It's also time to install the drive shaft to make sure there's enough clearance. The Inland Empire Driveline driveshaft is so cool that I've put off installing it so I could show it off to garage visitors. Everyone marvels at how light it is and the beautiful sheen of the highly polished aluminum. I kind of hate to hide it! 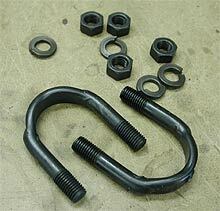 I took the U-joint mounting U-bolts down to Maury at Big Moe Products/MRI Machine to have them black anodized. 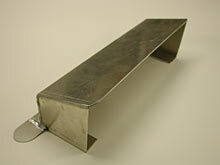 They have a process involving a series of dip tanks that will put a black rust-resistant finish on steel. 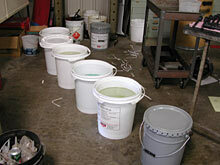 They use it on a part they manufacture for a customer so I asked (begged) them to throw my stuff in with the next batch.